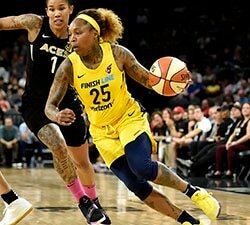 Note: WNBA.com’s Race to the MVP, released every Wednesday during the season, is the opinion of this writer and does not reflect the views of the WNBA or its clubs. 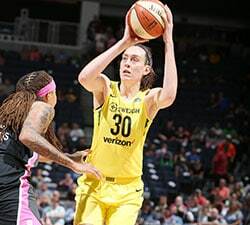 With the second half of the season underway – and only about six weeks remaining – it’s time to look at the current favorites to win WNBA MVP. As we mentioned last week, Brittney Griner will not be on this list until she returns from the unfortunate injuries that halted her MVP-caliber season. The good news for this race, however, is Elena Delle Donne was back on the court Tuesday night and looked as dominant as ever. It’s too bad she couldn’t play in the All-Star Game, but the mini-break came at an ideal time for the recovery from her ankle sprain. Let’s hope Delle Donne doesn’t miss any more games after being sidelined for three in the past two weeks. If she stays healthy, Delle Donne should be one of the top MVP candidates down the stretch. We mentioned last week that Fowles might threaten to break Nneka Ogwumike’s league record for true shooting percentage in a season (73.7 percent). Well, after shooting a combined 16-for-20 from the field in her last two games, Fowles is creeping closer and closer to that mark. She also has a valid case to win her fourth Defensive Player of the Year award. Ogwumike and the Sparks (15-6) fell to Chicago at home in their final game before All-Star, but bounced back by holding off Seattle on Tuesday. Ogwumike has recorded double-figure rebounds in four straight games and is now nearing her average from last year’s MVP campaign. She was also great in the All-Star Game, scoring 22 points on 11-of-15 shooting. Parker continues to add to her highlight reel, the latest play being a massive block on Breanna Stewart on Tuesday. Stewart more than held her own against L.A. and its two former MVPs – she had six blocks of her own – but it was Parker’s team that earned the W. She continues to do a little bit of everything for the league’s second-place team. In her first game back, Delle Donne filled it up with 29 points (10-of-18 shooting), 10 rebounds, four assists and three blocks to help Washington earn a resounding win over San Antonio. She finally missed a free throw, but still tied DeWanna Bonner’s record for consecutive makes in a single season (59). Next up for Delle Donne is a battle with rising star Jonquel Jones and the Sun on Friday. Charles has been on a tear in the last few weeks, especially on the glass. Unfortunately, that isn’t always resulting in wins for the Liberty, who boast a disappointing 10-10 record. Still, Charles has been putting up astronomical numbers lately and deserves to be recognized for it. She just became the first player in WNBA history to post a trio of 20-point, 15-rebound games in a calendar month. At All-Star weekend in Seattle, Moore showed glimpses of the player that many feel is the most talented in the league today. 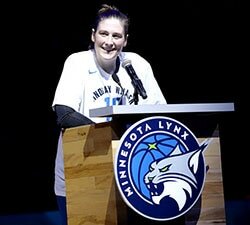 Incredibly, the Lynx are 17-2 despite her subpar efficiency this season. She kept the momentum from All-Star going on Tuesday, when Minnesota held off New York thanks to Moore’s 27 points on 11-of-20 shooting. Perhaps the MVP performance at All-Star was a confidence boost. Speaking of MVP performances in the All-Star Game, Jones was maybe the most impressive player on the court in Seattle. The league’s veterans recognize her as a future superstar. She’s already the best player on the East-leading Sun, who dominated Chicago for a 93-72 win on Tuesday. It might be too soon to truly consider her for MVP, but Jones is a leading candidate for Most Improved Player. The Storm couldn’t complete their comeback at L.A. – thus suffering a second straight loss – but Stewart had yet another outstanding game. Matching up against Ogwumike and Parker, she finished with 23 points, five rebounds, five assists and a career-high six blocks. That is tied for the most blocks by any player this season. Stewart will need help if the Storm want to make the playoffs, but they have the lowest-scoring bench in the league. Like Delle Donne, Diggins-Smith saw an impressive free throw streak come to an end. She finished a lousy 8-for-9 at the line – missing a free throw for the first time since July 1 – en route to 21 points against Indiana. Reserve guard Aerial Powers returned from injury on Tuesday, which should be a massive help to Diggins-Smith and the Wings in their playoff chase. 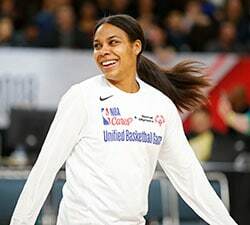 Thomas replaced Delle Donne in the All-Star starting lineup for the East, which also featured the Sun’s Jones and Jasmine Thomas. Alyssa Thomas isn’t the greatest fit for an All-Star Game due to her lack of outside shooting, but everyone on the court knew what she could bring to the table. She was the catalyst against Chicago on Tuesday, recording a team-high 20 points, nine boards and five assists.